Summer’s here. Needless to say, you will be spending a lot of your time in the pool. Plus, you are in no mood to sweat it out in the gym in this heat. But, hey, don’t skip your workout session just because it’s hot outside! Here are some workout routines that will allow you to stay in the pool and workout at the same time! Win-win, right?! Core rotation Some basic core exercises in the pool never harmed anybody, right? Start these core rotations and you will be on the right path to toning it up! Pool sit-ups Having a summer body means having flaunt-worthy abs, and pool sit-ups seem like the best way to achieve that! Water jogging Jogging in water burns 17 calories per minute more than on land. Enough reason to start water jogging right now! Chaos cardio Create currents in the pool by running in a zigzag pattern and run through them. This one works brilliantly for your core muscles. Ball lever If you are looking for the best way to perfect your abs and triceps, this routine is the way to go, Fitness freaks, this might just be your next favourite exercise! Streamline jumps Move your daily workout routine to the pool. 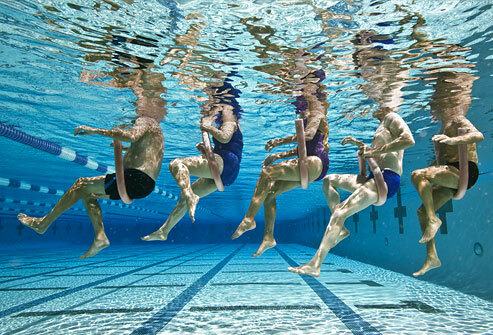 Do as many streamline jumps as you can in the pool and strengthen your core like never before! Wave maker Doesn’t this sound like so much fun? Just hop into the pool and make the largest wave you can. Involve your abs, hips, thighs and feet while doing it and move closer to achieving your #bodygoals!